So how was your Valentine's Day? I hope it was a good one, especially if you tried any Rachael Ray recipes. After a request for a "garlicky shrimp pasta thing" from my husband, I went with a combo of two recipes. I made 4 Minute Spicy Garlic Shrimp and the Spaghetti Aglio Olio (Garlic and Oil). The spaghetti recipe includes a Spicy Shrimp recipe, but the 4 minute one just looked better to me for some reason. A normal person would have thought they were similar enough and just printed one recipe, but I have never professed to being normal! While not as fancy as our usual Valentine's Day meal, it got rave reviews. To round out the meal, I made some Roasted Asparagus. Magazine Update: According to the New York Times: "The biggest increase among major magazines was for Every Day with Rachael Ray, which jumped 67 percent from the second half of 2006, to almost 1.7 million. Other cooking magazines posted modest gains." Tracey of Foodie Obsessed tried Rachael Ray’s Rabe-Stuffed Stromboli Bread from Rachael Ray's talk show. Laura of Living with a Purpose Everday served Strawberry Whipped Sensation from Every Day with Rachael Ray and her guests were licking their plates! Patsy of Family, Friends and Food tried Honey Nut Chicken Sticks from 365: No Repeats and found they were a great choice for the whole family. 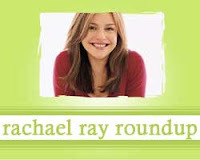 Cate O'Malley of A Nice Cuppa highlights a creative centerpiece ides from Every Day with Rachael Ray. Despite not being much of a Rachael Ray fan, Sweet and Saucy tried Tenderloin Steaks with Gorgonzola and Herbs with good results. Yum Sugar features a post by partysugar, who declared that a recipe for Cheddar Beer Soup from Every Day with Rachael Ray was better than a recipe for Cheddar Soup from Cook's Illustrated. Rachael has a list of kitchen essentials, or items you should have in your pantry, on the magazine website. It's called the Every Day Kitchen. Thanks for the comment, Madeline! I will definitely try it again with the Boursin. I couldn't believe I forgot to buy it when I went to make the recipe. Well, my reasons for wanting you to try it with the Boursin are pretty selfish - I want to know how it is so I know whether or not to try it!